God of buxom Dame and blue devil. In order that every appearance of pantheism, naturalism or nihilism be avoided, it is not permitted to scatter the ashes of the faithful departed in the air, on land, at sea or in some other way, nor may they be preserved in mementos, pieces of jewellery or other objects. Bury a seed amidst the dust of my bones. my eyes so someone might see. my ribcage in soot, free my heart? how to abide as branches to The Vine. no yearning for a collected body. in the roots of an unborn seed? girl. Give her my lungs. fold them neatly at her bed’s foot. Both of these poems stem from the Roman Catholic influence in my native Trinidad. Being raised Catholic, there are so many rules around what we can do with our bodies, even when we die. I find myself trying to exert autonomy but being afraid to offend the Church by doing anything “too pagan.” That is where “When I have left my body” comes from. “God of sweat and mud and rain” examines the many cultures of Trinidad that are present in Carnival. Slaves making the festival their own, bringing African influences into the mix, I think was a kind of quiet resistance enacted against the French slave masters who brought Carnival to Trinidad. It also reminds us that Carnival—like Easter and the Winter Solstice—was originally a pagan ritual before the Church repurposed it. 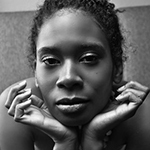 Daria-Ann Martineau was born and raised in Trinidad and Tobago. After earning a BA in Speech and Hearing Science from The George Washington University (DC), she saw there were more interesting ways to understand language. She now holds an MFA in Poetry writing from New York University, where she was a Goldwater Hospital fellow. She is an alumna of the Saltonstall Arts Colony and the Callaloo Creative Writers Workshop, and the Bread Loaf Writers Conference. Her poetry has appeared in Narrative, KinfolksQuarterly, and The Collagist, among others.